Details announced for the first-ever oneworld MegaDo. It was a big weekend this weekend. Not only did Oklahoma win (another) OU-Texas match up, but the very first oneworld MegaDo was officially launched last night in Los Angeles. If you’re not familiar with a MegaDo, it’s an event that started out three years ago in the FlyerTalk forums that pulled together Star Alliance frequent fliers, mileage geeks and aviation fans and gave them the opportunity to fly around the world and meet with executives from the aircraft manufacturers, the airlines that make up the Star Alliance, and their hotel partners and also gave the participants a behind the scenes tour of their operations and facilities. It’s been wildly successful and for three years AAdvantage geeks and oneworld geeks have had to watch all the Star Alliance fans have all the fun. 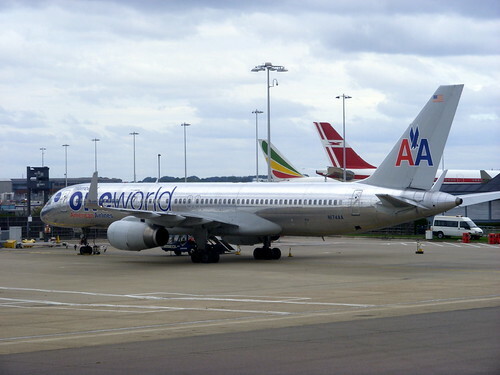 Earlier this year, the discussion of a MegaDo event of our own started to gain momentum in the milepoint forums and it became a reality when American Airlines, and AAdvantage President Maya Leibman and the team she leads got behind the idea of a oneworld MegaDo and announced in the forums their desire to make it happen. Much to American’s credit, and to the credit of milepoint and Boarding Area founder Randy Peterson, milepoint member tommy777 (incidentally he was one of the three people that started the original Star Alliancce MegaDo), and other members of the milepoint AAdvantage community, the first oneworld MegaDo has been announced. A MegaDo is a chance to meet fellow travel junkies and hobnob with top executives in the travel industry. MegaDo participants are lavished with gifts, enjoy behind-the-scenes tours not available to the general public, travel in style on chartered flights, and earn miles and points to boot. In short, every MegaDo is a once-in-a-lifetime travel event … and it’s an experience you will never forget. A day with American Airlines. Meet their senior management and get behind the scenes. 6 PM The FIRST annual oneworld MegaDo flight. 8 PM Arrival in Seattle, landing at Boeing Field. Boeing welcomes us and treats us to dinner at Boeing Field. 4 PM Flight to Los Angeles for the next part of the program. oneworld program in LAX featuring multiple oneworld carriers. Meet oneworld at JFK. Cathay, British Airways and American Airlines. Tours etc. The entire premium cabins have been reserved for us. This is the FIRST ever MegaDo scheduled flight with ONLY MegaDoers in the premium cabins. American is getting involved in a big way and not only will participants earn redeemable and elite qualifying miles with MegaDo flights, but they’ll also have a chance to earn up to 57,000 bonus AAdvantage miles with a special oneworld MegaDo promotion. Hyatt, who is also one of the sponsors, is also offering a promotion of their own to people that register for the event with up to 200,000 bonus points for stays through January of next year. There’s going to be a special booking site setup just for this event and while pricing hasn’t been finalized, the North American segment will probably range from about $800 in economy class to $1,700 up a the front of the plane. To read more about the oneworld MegaDo or to follow details as they become final, go here to the official site. Mike Reed over at Chasing Executive Platinum was at the event and has coverage of the launch party. He even got his photo taken with Maya Leibman!